Guitarist and singer Mark Williamson becomes the group’s seventh member for A New Day Is Beginning. This is a much more polished sound than Life’s A Rainbow, with pop and MOR influences weighing heavily. 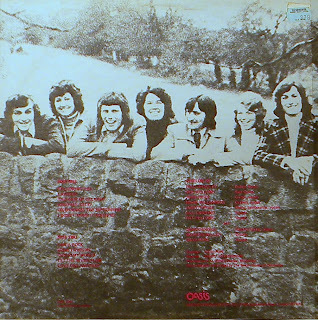 Still a folk group at heart I suppose, but the vocals are a lot smoother and their acoustic sound has been broadened to include piano and string synthesizer, making the ballads in particular now come across like pure easy listening. Also some electric guitar edging a few songs into a light rock or folkrock format. ‘Jesus Makes The Difference’ states that Jesus is “like the cocoa in a chocolate bar”. Produced by Dave Pope who also appears on vocals. Williamson had some subsequent solo lps. (The Archivist by Ken Scott, 4th Edition). Hi D. Is it the right album that you posted, the tags says Life's A Rainbow but you posted it as A New Day… ?? The exitement in the comment before is possibly a joke because this album is more or less easy listening music. I think the other album by Lifeline (UK) (Life's a rainbow) sounds much better. This earlier album is a really nice english folkalbum and is not as perfect as this one. (I realised that 'Life's a rainbow' is even included in the all time favourite Top 10 of the diakoneo) In some cases the early albums by bands are much better. For example the album by the band 'Cloud' on this blog I think is very good. Than I heared a later album by the same band I was disappointed. Anyway thanks for your work. On the blog I found some rare music that means a lot to me and that I listen to again and again. If it is more middle of the Road (MOR) Then it is right. I think I forgot to change the name before I uploaded it. Was trying to get ready for vacation so Made some mistakes in my haste. But I have been able to post for you even while I've been on the road. I am not sure what all the fuss is about, but you are putting up so many amazing albums (BC and AD) that is difficult to know how to say THANK YOU, but T H A N K Y O U kind friend. May His love be multiplied to you … how many X I am not sure, but as much as you are allowed to have…Blessings brother. A New Day Is Beginning by Lifeline may come across as easy listening, but the album was polished, and well produced. There is not a dud song on the entire album, and sounds full bodied on CD. A happy, feel good album. Recommended.